Developed by a Benedictine monk in 1510? Maybe. The story has it that a Benedictine monk, Dom Bernardo Vincelli, came to Fécamp from Italy in 1510, carrying various exotic spices. A specialist in alchemy, he purportedly developed Bénédictine liqueur, a mixture of 27 plants and spices, in the course of looking for an elixir of long life. It may not have lengthened life, but perhaps it made it more pleasant. The legend says that the monks continued to create (and presumably enjoy) Bénédictine for some 300 years, until the French Revolution, when the recipe was lost. Enter Alexandre Le Grand, a wine merchant in Fécamp, who in the 1860s "found" the recipe among the papers in his library. It took him about a year to decipher the recipe and he first produced the liqueur in 1863. Paying homage to the inventor, he called it "Bénédictine." Le Grand got permission from Rome to use the name and the coat of arms of the Benedictine Abbey in Fécamp. He also kept the Benedictine's motto, DOM, Deo Optimo Maximo (God infinitely great). He began manufacturing, invested in the company, and eventually made a fortune from the product. The Alexandre Le Grand Hall in the Palais Bénédictine was used for bottling, labeling, and sealing the bottles. You can also see pictures of the orphan girls he employed to do the work, supervised by nuns. In the early 1900s, some people began mixing Bénédictine and Brandy, to make a slightly less sweet drink. This caught on particularly with Americans (including Ernest Hemingway). By the 1930s it was quite popular, and the company began manufacturing and selling B&B. So is this story about Dom Bernardo Vincelli true, or did Alexandre Le Grand make it up? 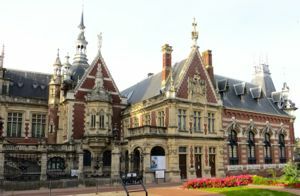 We'll never know for sure, but if you visit Fécamp and the Palais Bénédictine, you're sure to get caught up in the fascinating lore. Just don't expect to see any monks at the Palais. Note: We've used the French spelling Bénédictine when referring to the liqueur and the palace, and the Anglicized Benedictine (no accents) when referring to Benedictine monks and the order of St. Benedict. 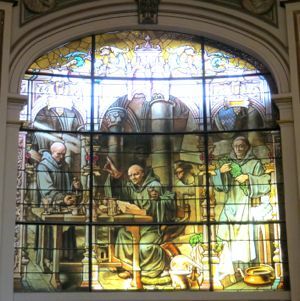 Above, Stained glass showing Dom Bernardo Vincelli making an elixir. 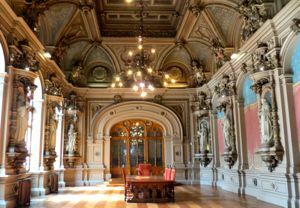 Below, One of many ornate rooms in the Palais Bénédictine, built by Alexandre Le Grand and "dedicated entirely to the glory of Bénédictine."